Juice Plus+ … Just Take It! “When is it best to take Juice Plus+? It really doesn’t matter. We suggest you start by taking ONE fruit capsule with a large glass of water at breakfast, and ONE vegetable capsule with a large glass of water at lunch or dinner. After 4-5 days, double up to the recommended 2+2 capsules daily. If you have trouble remembering to take them, by all means take all four capsules at the same time, once you’ve been taking Juice Plus+ for a week or two. When Juice Plus+ first came out, there was a ton of “urban myths” generated about when and how to take Juice Plus+. Here are some examples that I am finding still exist today. Myth 1. Taking Juice Plus+ with hot liquids will destroy the enzymes in the blend. Myth 2. You have to take fruits and vegetables separately as the body digests them differently. Myth 3. You have to take fruits in the morning and the veggies in the evening. Myth 4. You shouldn’t take all your Juice Plus+ blends at once in the morning, as they will not protect you later in the day. Now, it is understandable how these myths came about since Juice Plus+ was a novel whole food supplement and people were applying some of the rules that applied to food. But let me dismiss each with some reasoning and some findings from the research itself. First of all, you couldn’t drink a liquid hot enough to destroy the enzymes in the product. Secondly, because the fruits and veggies have all been juiced and turned into a powder, there is no digestion required for the body, so you don’t have to worry about combining the Orchard, Garden and Vineyard blends. Also, the research bears out the effectiveness of combining all the blends because – now this is quite interesting – when they started doing double-blinded, placebo-controlled research, they realized that some people had already been exposed to Juice Plus+. And double-blind means that neither the subjects nor the investigators should know who is taking Juice Plus+ and who is taking placebo. So to make the product look different from what is marketed and the same as the placebo – they combined all the 3 blends into one large, horse pill! And so, the research proved that combining the blends still works! Furthermore, the research shows a carryover effect with Juice Plus+. What is carryover? Well unlike traditional isolated vitamin and antioxidant supplements, the nutrients in Juice Plus+ are recognized the same as whole food and certain nutrients are sequestered into certain tissues of the body and stored there. This provides at least 24 hours of additional protection, which is unlike isolated supplements, where only a small percentage of the nutrients get absorbed in the blood and is only effective for a few hours at best. Now if you are into reading clinical papers and want to know more of the details, you might want to pick up the study published in the Journal of the American College of Cardiology, done at the University of Maryland. Before studying Juice Plus+, Drs. Plotnick and Vogel – who are leaders in the field of cardiology – had never seen a carryover effect when using traditional supplements to curtail the spasm of arteries post a high-fat meal. 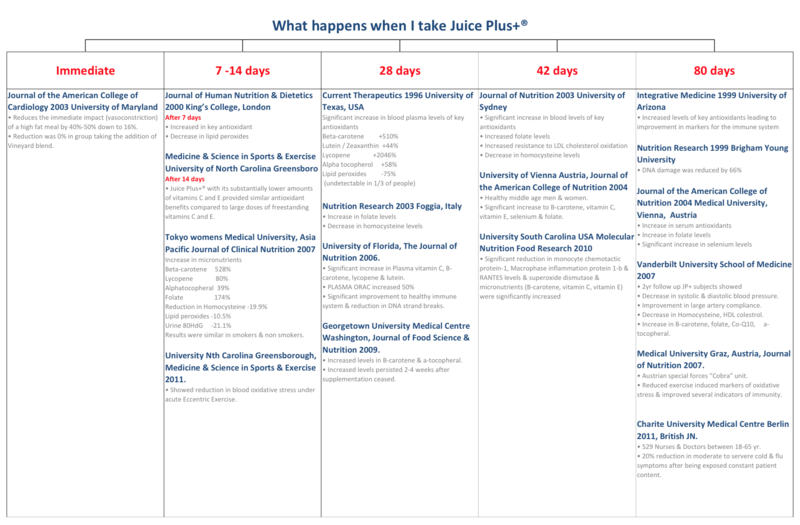 When and How Should I Take Juice Plus+? Now some people can only remember to take their Juice Plus+ in the morning. Great, take all six capsules, 2 Orchard, 2 Garden and 2 Vineyard all at once in the morning. Some people need to put it near their toothbrush and take 3 in the am and 3 in the pm when the brush their teeth. Great! Some people who are quite sensitive, and can only take the Garden blend in the morning. Otherwise it gives them too much energy and they can’t sleep well. For those, definitely get your veggies in earlier in the day. If you ever go to a juice bar and notice an energy drinks they have will have lots of veggies in the juice. Veggies are energy giving naturally. That is why the Japanese traditionally have veggies in the morning. 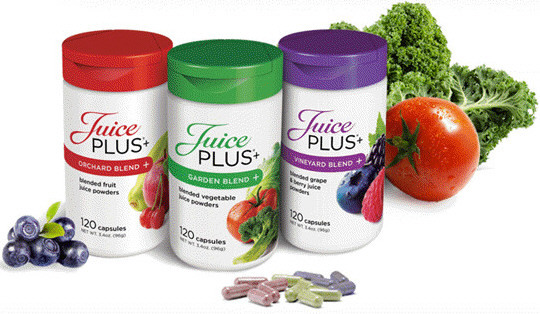 How Much Juice Plus+ Should I Take? Some people want to take more because they are pregnant or have a health challenge. That is fine as well because you really cannot overdose on Juice Plus+. And folks, Juice Plus+ is cleansing and detoxifying your body 24/7, no matter when you take it, as long as you take it. So the bottom line is Just Take It – at least then recommended amount – however it works for you. What Happens When I Take Juice Plus+? Our 20+ years of published research answers this question. Click on the image below for a full-size version.